Use this 25 foot C7 stringer for our incandescent or LED C7, G30, G40, or G50 E12 base globe bulbs when lighting up your home or business interior and exterior this holiday season. Can be used in a restaurant patio string light application that provides eye apealing ambiance. Made with 25 E12 base candelabra sockets from the industries best. Three strings can be connected end to end when using 5 watt bulbs. Safe for indoor and outdoor use. 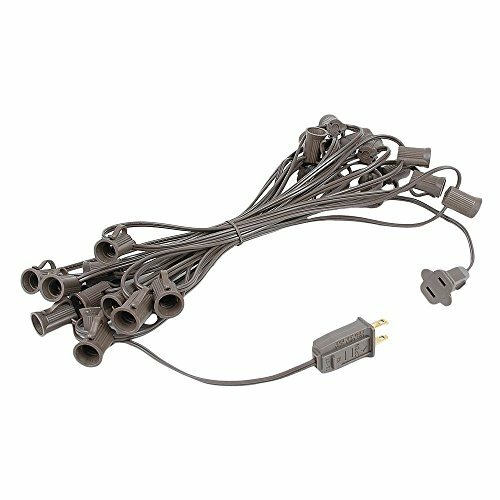 Novelty Lights offers this commercial grade C7 outdoor string light Christmas stringer that is 25' long with 12" spacing and has a 6" lead on both ends. Each string has 25 Admiral brand sockets and is UL listed for indoor and outdoor use while being used for Christmas lights, house roofline, or outdoor patio string lighting. This C7/E12 base stringer uses our incandescent or LED C7, G30, G40, or G50 E12 base globe bulbs which are sold separately. Each stringer comes with a fused 5 amp male plug which makes this product safe for indoor and outdoor use and is connectable end to end with a max run of 75' using a 5 or 7 watt bulb. Installation Tips: Patio Use; We recommend using "aircraft wire" to use as support cable for a professional look and if you choose not to use a support wire then you can mount the string at various pivot points depending on your application. Roofline Use; Use in accordance with our all in one clip (ASIN B004TNDB2I) so your C7 bulb points upward and is securely faceted to your gutter or under the shingle. Always mount stringer first then screw in light bulb last.